Three Floyds is quickly becoming one of my favorite breweries. From the crazy off-the-wall packaging to their eclectic selection of beer styles, it’s hard not to find something to like amongst their products. Gumballhead is one of the brewery’s five year-round offerings, and it’s arguably their most popular. This American Wheat Ale was initially a summer seasonal, but the demand grew so large that Three Floyds decided to start brewing it year-round. When poured into a glass, Gumballhead has a hazy golden appearance, and a combination of hops and fruits lend a pleasant aroma. Its taste brings these smells to life — the hops are present, but they give way to strong notes of grapefruit and peach. These fruity elements make this wheat ale stand out from others, and they work surprisingly well. Light and refreshing, Gumballhead is perfect for summer drinking. Its initial hoppiness reminds me of Half Acre’s wonderful Daisy Cutter, but the fruity taste gives it its own unique flair. This is definitely worth pursuing, and it would make an excellent beginner beer into the eccentric world of Three Floyds. I live in Washington State and only drink microbrews. 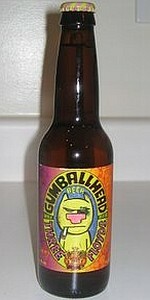 I would love to try Gumballhead Beer. My favorite is Haywire by Pyramid Brewing Co. in Seattle. Gumballhead sounds similar in flavor. How can I get some to try? I haven’t had anything from Pyramid Brewing Co. but will definitely keep an eye out for it. Thanks for the recommendation.